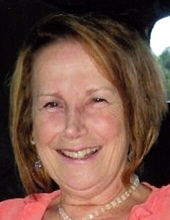 ROCHE, MONICA (Faherty), age 74, passed away after a long battle with CNS Lymphoma, peacefully at home in Norwood, Massachusetts on Sunday, February 10th, 2019 surrounded by her loving family and friends. Born in Lettermore, County Galway, Ireland on August 2nd 1944, she was the daughter of the late Patrick and Sarah Faherty and sister to Maureen Geohegan, Paraic Faherty, the late Tom Faherty, the late Joe Faherty and the late John Faherty. In 1969 she married Sean Roche; together they had four children – Sean, Patrick, Colleen and Maureen. She is survived by 15 grandchildren and many nieces and nephews in Ireland & England. From the onset of cancer in 2012, she would not have been with us to this day if it had not been for her loving husband Sean who was by her side throughout every step of this battle providing the much needed support and courage to keep going. She had the support and prayers of many, and throughout she always met her visitors with her beautiful smile. Funeral from the Kraw-Kornack Funeral Home 1248 Washington St. Norwood, Thursday, Feb. 14, 2019 at 9:30am followed by a funeral mass at 10:30am at St. Timothy’s Church 650 Nichols St. Norwood, MA. Visiting hours will be held on Wednesday, Feb. 13, 2019 from 4-8pm. Burial will be at Highland Cemetery in Norwood. In lieu of flowers, memorial donations may be made to dear family friend Joseph Mawn’s Pan Mass Challenge to support fighting cancer at the following link; http://profile.pmc.org/JM0454. To plant a tree in memory of Monica (Faherty) Roche, please visit our Tribute Store. "Email Address" would like to share the life celebration of Monica (Faherty) Roche. Click on the "link" to go to share a favorite memory or leave a condolence message for the family.